Potato pancakes – or latkes – are traditional for both Hanukkah and Christmas for people from Eastern European cultures. But you don’t need a holiday to enjoy them – they are delicious! My senior year in college, I shared an off-campus apartment with another woman. Though we were technically off-campus, the building was actually closer to many of our classes than our dorm had been. Friends passed our corner all the time on their way to classes or the library, and we constantly invited people in for some tea or a meal. December was particularly, shall we say, active. End of semester, we were all writing term papers, finishing projects, studying for exams… And every night, I lit the candles on my Advent wreath… (No Christmas Tree – I was going to be back home by Christmas.) By the time we got to Hanukkah and her menorah – and the last couple of days of term – everyone was revved up… So we told everyone we were religious pyromaniacs, come watch us light candles, and have a meal (not all of our friends were taking time for real food, though we all seemed to manage to get to the Italian bakery up the road…) We’d take a break, make, eat, and share latkes (and other food – I seem to remember that we ate a lot of eggs that week, they’re fast and easy) and discuss class notes and term papers over dinner. If you just had a box grater, as we did, they are a bit of a nuisance, but good enough to be worth it. They’re simple enough that when I worked in daycare, I brought in a plastic grater (no grated knuckles!) had the children take turns grating potatoes (so no one got tired of it) and help mix them, though obviously I did the frying. With a food processor they’re easy. And so good! Then – this is key – I put them in a strainer, and left them to drain. 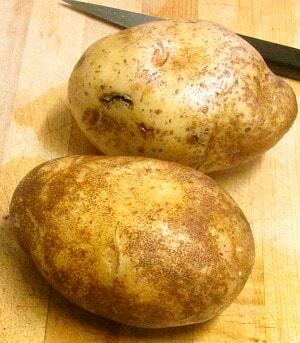 Especially at this time of year, when potatoes are still fresh, they’re quite moist. I want to get rid of as much of the liquid as I can. I added a pinch of salt to help pull the water out, and stirred it quite well, then drained it about half an hour, turning and pressing every 10 minutes or so, and you can see in the pictures how much the grated potato shrank. While that drained, I also peeled and grated an onion. After about half an hour (and more time would not have hurt!) I discarded the liquid, beat two eggs in a large bowl, and stirred in the potato and onion. Then I added three tablespoons of flour – I used millet flour, here, but this is a place where you can use pretty much whatever works for you… it’s there to absorb moisture and help the potatoes hold together. Start with two tablespoons, add the third only if you seem to need it. These potatoes were remarkably wet. There – I had my batter! Now, the whole point of latkes for Hanukkah is that they are cooked in plenty of oil, which symbolizes the oil that miraculously burned in the lamps in the Temple for eight days. Without any theological interest at all, though, potato pancakes do best with a good bit of oil in the pan… You do pan fry, rather than deep fry them, but you need enough oil to come up a bit around the rough edges and brown the grated potato – and it needs to be hot enough to crisp the potato, not just get soaked up. I used a cast iron pan, and put it over medium heat while the potato was still draining, as I wanted a good, steady, even heat. Then I added the oil, and let it heat a minute. You start with the pan fairly hot, let the patties cook about five minutes, to brown and start to hold together. Then turn them over, give them a few minutes on that side, and lower the heat… and cook until done. I’m sorry, I can’t give you exact timing – it depends on the heat of your pan and stove, how moist the potatoes are, how large you make your pancakes (these are big ones) and other variables… The goal is that the outside is crisp and brown (but not burned – watch for that) and the inside is tender and creamy, but fully cooked. (By the time the potato is soft, the egg is sufficiently cooked.) Smaller pancakes have more crisp crust, big ones like these have a creamy soft center, it’s all a matter of taste. And as long as you are going to the fuss of grating potatoes, make plenty – if you don’t eat them all right away (and you just might!) they reheat well in a quick frypan. (We finished these for lunch the next day.) I cooked this recipe in two batches of four potato pancakes each. Serve hot. 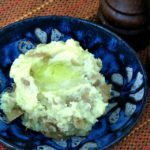 They are traditionally served with sour cream or applesauce (or both!) but you can certainly vary that. In fact, you can vary the whole recipe if you like. 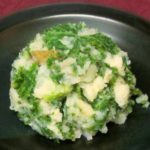 I have a friend who routinely adds minced jalapeno with her onion (not at all traditional, but excellent) You can substitute sweet potatoes, and the result is quite different, and quite good. (I’ve done that for both Christmas and Thanksgiving!) I made potato pancakes to serve with ham and sausage for Christmas to a friend of Hungarian background – a meal he’d last eaten at his mother’s table. Try them – you may find you have a new tradition, too! Potato pancakes - or latkes - are traditional for both Hanukkah and Christmas for people from Eastern European cultures - and they are delicious! Scrub and trim potatoes, and grate. Sprinkle lightly with salt, and stir, then place in a strainer and let drain at least half an hour, stirring and pressing every ten minutes or so, to remove excess liquid. Beat eggs in a large bowl, and add potatoes and onion. Stir well. Add flour, enough to help absorb some of the liquid and help the potatoes hold together. Heat oil in a heavy pan. Form patties from the potato mixture, squeezing out excess liquid. Carefully place them in the oil. 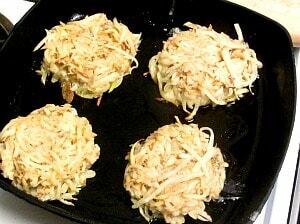 Cook about five minutes, until bottom starts to brown, and the patties hold together, then carefully turn them. After about three minutes, lower the temperature, and continue cooking until done, probably about ten minutes. Serve with sour cream, or apple sauce. 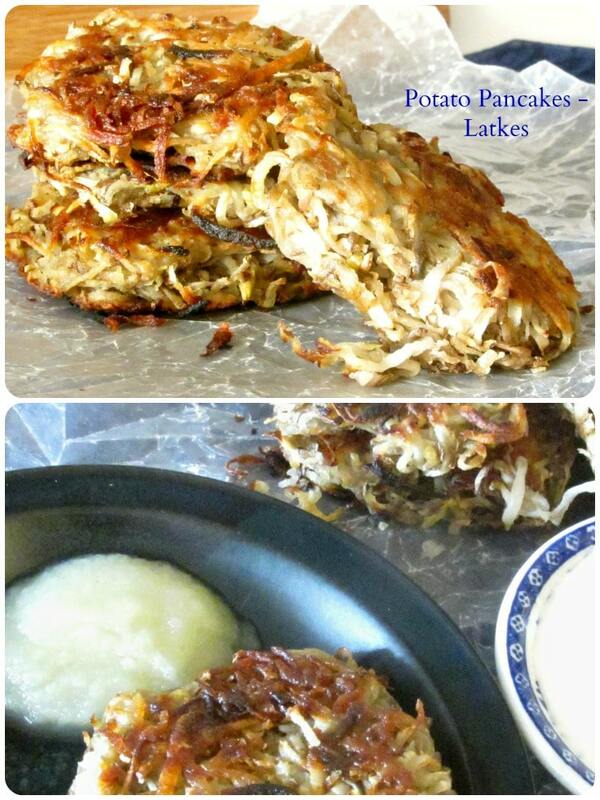 I always love an easy, simple latke recipe and these look delicious! Thank you! It is certainly a simple version, but that's just what I want! This sounds awesome although I'm quite partial to using sweet potatoes which can be quite fragile. I'm just wondering if I could use sweet potatoes to form part of this recipe? Thank you! Oh, sure - I thought I'd mentioned sweet potatoes... I've done it with just them, and it worked fine. (Or at least, the big orange ones we have here - there are different kinds, I don't know if that matters.) Mixing them, though, that sounds interesting... I may try that. I've always loved these! So simply yet so tasty! You're welcome! Every time I make them, I wonder why I don't make them more often...especially now that the food processor does the hard part. I love potato latkes. Good recipe. They have become very popular in Melbourne as a brunch meal. Also good with an egg served on top. Oh, what a great idea! I'm going to have to try that. Thank you! It's been a long time since I made these...reading this makes me want to make them again soon. I forgot how good they really are....perfect with dinner or brunch!! Yeah, that's me... I make them, and think "That wasn't hard... Oh, they're so good!" And then I don't make them again for another year. What is up with that? I definitely have to make them more often... and I hope you make and enjoy them soon, yourself! Terrific! I do hope you enjoy them! Thank you! What a lovely thing to say! And they just dress it up a bit, don't they? Thank you! Well, this is gluten free - I used millet flour (though someone who is not can use AP flour.) Or do you mean grain free? The flour is really a binder, and I don't think almond flour would work... but buckwheat flour probably would. Or perhaps tapioca? (I've never used it so can't tell you much about it...) You do need that bit of starch, though, to hold the egg and the moisture from the potatoes. I love potato latkes! It reminds me of my childhood and my grandmother! Your recipe looks superb and I can hardly wait to try it! They're that kind of recipe, all right... I didn't grow up with them, but loved them once I ate them! And thank you! Yummy! I have a soft spot for every kind of fried food, and these potato pancakes look so good! LOL You just never get that brown crispness with any other method, do you? Thank you! 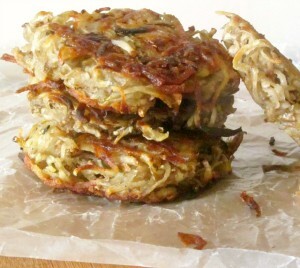 I agree - a food processor makes latkes *so* much easier to prepare! Yours look so perfectly golden and crispy - YUM! These look pretty darn good. I would eat these. The first time my daughter went to a Hanukkah celebration she ate about 1000 potato pancakes and then asked if we could please convert so we could celebrate Hanukkah with potato pancakes every year. LOL! They are are good... You don't have to convert, of course ;-) I made them for a Hungarian friend for whom I cooked Christmas Dinner like Mom used to Make. Just as traditional for that! 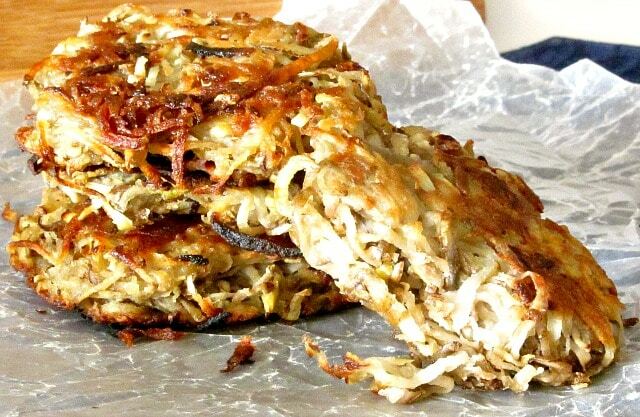 oh yummy this potato pancakes looks so delicious… wish I had some right now!" Thank you! Eat them right away - they're best hot! These look delicious, I love potato pancakes. You must really love them to to go through all of that trouble in your school years. 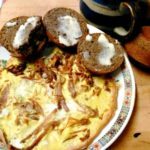 Thanks for sharing this story and recipe! LOL - it was the week before exams, and we were writing term papers. We needed reasons to get up and move around, and change focus, or we'd burn out! But yes - we both did like to cook. (And this attracted study partners to our house... win, win...) And thank you! Potato pancakes are the best - so simple and delicious!! These look delicious! Perfect as a side for the holidays. Love it! Thank you! We've enjoyed them that way. 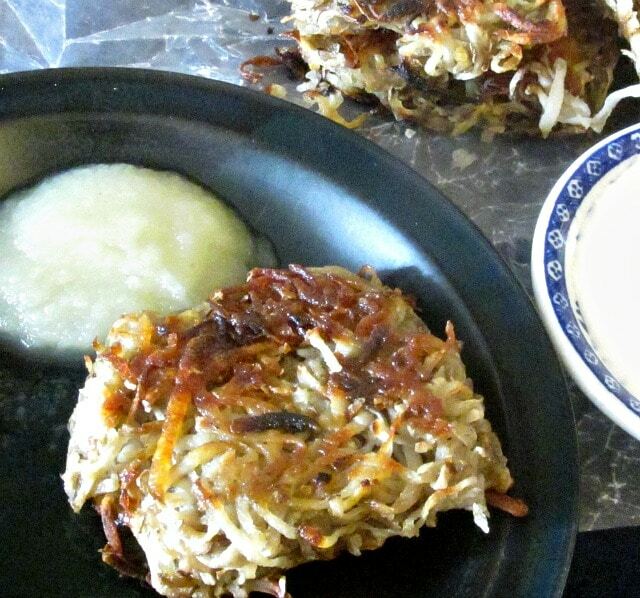 I love latkes with a dollop of sour cream but have rarely made them myself. Looking forward to making this recipe at home! I know - I don't make them nearly often enough! I think of them as difficult - but the food processor solves most of that - and forget how good they are!